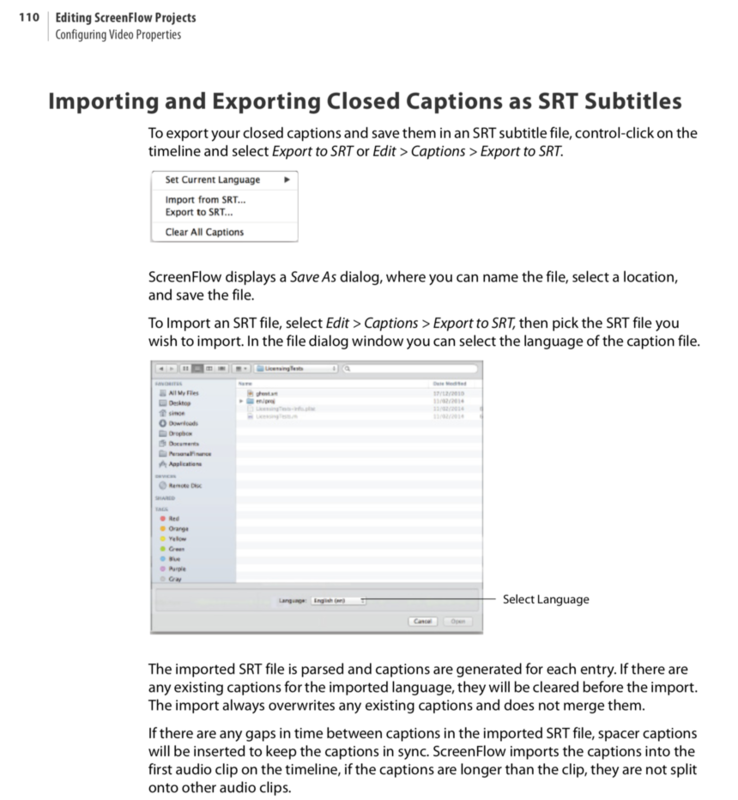 Instructions for Importing and Exporting SRT files from page 110 of the User Guide. There's a mistake in the user guide. Import should use import menu selection. Angus Pyke You're welcome of course. Taylor Howe Perhaps there's an issue with the SRT. How was it generated? Have you tested it in any other program? Perhaps link to it so I can download and test. CraigS I only tried in Screenflow. The SRT file was generated from rev.com (a transcription service) I've attached the file I was trying to use. Thanks for any help you can offer! Taylor Howe Using ScreenFlow 8.1 I had no problem importing your closed captions. and there they are. Very simple. CraigS Thanks for your quick response. Your video helped. I didn't know that I needed to click View --> Show Caption Track. Good stuff! I'm able to see the caption track in my timeline now. How do I get it to appear in the video? Taylor Howe View > Show Captions and you'll see them over your video. Sometimes something funny goes in this regard. 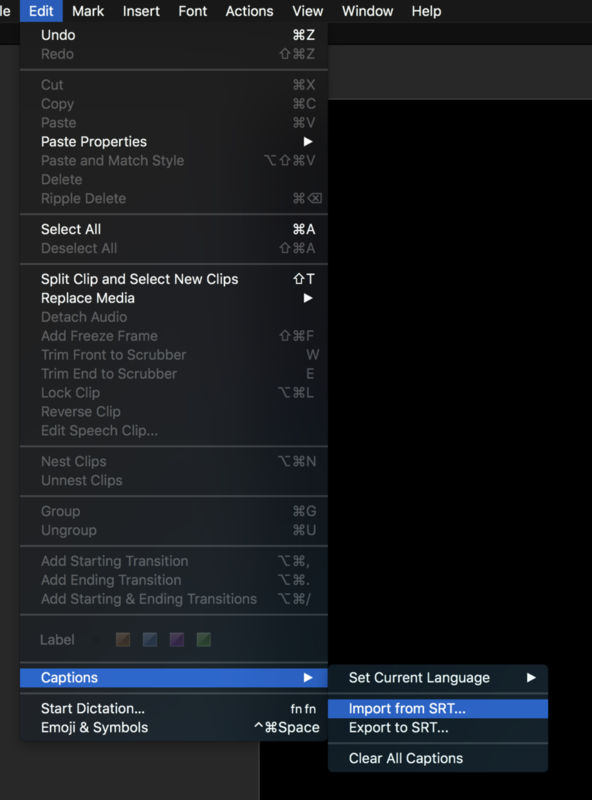 I have 2 Screenflow files (v 7.3, Mac OS High Sierra), and one accepts the subtitles when imported from an SRT file, and the other doesn't. That is, one displays the subtitles, and the other doesn't, even if 'show captions' under the 'view' menu is ticked. What's the difference between these files? Well, one has a smallish mp4 video file in it - the other a 2.53 GB .mov file (which I did delete most of from the timeline to leave a small portion of it). However, a small .MOV file of 4 MB or so did display the subtitle file when imported, so size seems not to be the issue. All I would suggest trying is recreating the Screenflow file by making a new document and importing the media you want to use and then importing the subtitles again. In my case, I think it is probably a problem with the particular Screenflow file concerned (or the video in it? ), because other Screenflow files containing different media files do display the subtitles. P.S. Annoyingly, though, I can't isolate exactly what the problem is and confirm for certain that it is a problem with that particular Screenflow file, or the video in it, because when I've tried to drag various .MOV files from my media library on to the timeline, Screenflow is crashing a lot (which is a separate issue). Update to 7.3.2. Please test the file you're importing in another document or even another program that can read SRT files to make sure the file itself is OK. 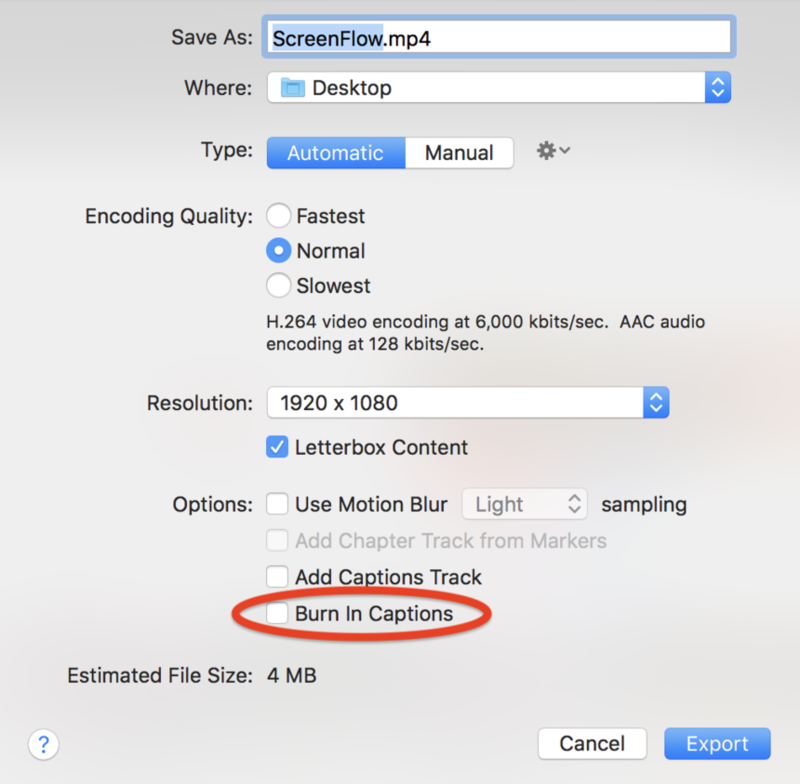 I don't think the file size in the ScreenFlow document would be a factor although the duration might depending on the start time and where the captions are supposed to show. Also, when it works properly does it allow me to export a video with hardcoded subtitles? Fábio Veloso The video only shows you selecting the SRT file and not the outcome. I'm not sure what you mean by "hardcoded." Closed Captions are not burned in. They are enabled by the viewer. Burned in Captions are referred to as Open Captions. Fábio Veloso It's possible there's an issue with the SRT file itself and the timings. I'd have to look at the entire project and the SRT itself to see what the issue might be. This might be hard to see beecause I did this with just a desktop video recording and USB mic and then imported a known good SRT file. If your SRT is good I should be able to do the same with your file on my system. CraigS Thanks, it seems to be a problem with the srt. With a good srt, can I export the movie with the captions burned upon the image, hardcoded onto the movie? Fábio Veloso When exporting use "Burn In Captions"
I'm using Burn In Captions for an IGTV shaped video but the captions burn in is larger than the screen. Is it possible to change the size of the burn in captions track? Scott Winterroth Given that burned in captions are open, not closed, therefore not ADA specific that would be an interesting feature request. The challenge would be controlling that on export and knowing the size and positioning is what you'd desire. The alternative is just to build them visually in ScreenFlow as titles. Fill out the form and make the feature request anyway. Perhaps the developers can come up with a creative solution. Perhaps preset positions based on export frame size? Scott Winterroth You're welcome of course.